The wealthiest man in the Bible was King Solomon. Along with huge amounts of gold, silver, land, houses, exquisite furnishings, and elaborate gifts from numerous foreign leaders, Solomon owned 4,000 chariots, 40,000 horses and 1200 horsemen. Debatable as to whether it was an asset or a liability, Solomon owned 700 wives; just kidding about the "liability" remark, ladies. Clearly, Solomon owned far too much for one man. Obviously, the "fair-minded" citizens of his kingdom surely must have, in protest, organized "Occupy Israel." I wonder how King Solomon dealt with the angry Occupy Israel protesters and the sympathetic to their cause, Israel Daily Scroll newspaper? We can pretty much guess how King Solomon resolved the matter. According to the Bible, Solomon's extreme wealth was a gift from God. God gave Solomon an opportunity to ask for whatever he desired. Solomon asked for wisdom to best govern God's people. God was so pleased with Solomon's request, He gave Solomon wisdom, honor, and peerless riches. The biblical concept of God-ordained wealth does not jibe with the belief of the OWS crowd. OWS signs and interviews confirm they subscribe to the typical liberal belief that man is god — and given proper control can fix everything. Obama knows how to fire up his base, but is clueless when it comes to communicating with most Americans — people who do not nor desire to view themselves as victims. Due to his roots as a community organizer, Obama feels most comfortable ginning up hate in entitlement victim-minded losers well represented in the OWS crowd. When you squeeze an orange, orange juice comes out because that is what is inside. In other words, pressure reveals what is truly inside a person. Plummeting poll numbers have forced the real Barack Hussein Obama to surface. To fire up his base, Obama dropped the charade of being a post-racial unifying president. Obama has resorted to who he truly is and what he knows best how to do: rabble-rouse. Whenever Obama feels the need to rally his troops, his speech delivery strongly resembles that of a cliche character seen in old Western movies. In the movies, a loud-mouth guy addresses a crowd from the steps of the town's jail-house. His goal is to work the crowd into a frenzy — then get his hate-filled mob to overrule the sheriff, break the law, drag out the prisoner, and hang him without a fair trial before the circuit judge arrives on the train the next morning. Then there was the time Obama instructed a Hispanic audience to "punish our enemies." http://bit.ly/rnOpQ2 Such language sounds far more like a clarion call by a community agitator rather than the president of the United States. This is what I mean when I say Obama reverts back to his rabble-rousing community agitator days — sounding like the loud- mouth guy on the jail-house steps in the movies. The underlying, unspoken message coming from Obama and his administration is: those low-down dirty Republicans are against you! Republicans want you to die and the rich to live! If I were you, I would not allow them to get away with it! WHAT ARE YOU GOING TO DO ABOUT IT?!! Barack Hussein Obama is incapable of being an inspirational president to non-victim-minded, mainstream, traditional Americans who love their country. It is simply not in his DNA. 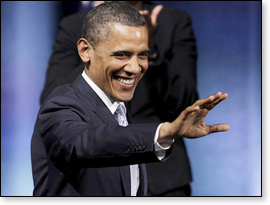 Obama appeals to the lower nature of a minority of Americans: OWS, arrogant, ungodly, lazy, and stupid. As I stated, we have two Americas. We have Obama's America and the America of us patriots. The greatest nation on the planet deserves and requires a president of "all the people" divinely led to inspire the best in us.